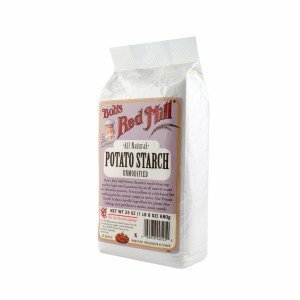 Potato starch is the starch the comes from potatoes that has been dried. It can be used as a thickener and also in gluten free baked goods. Potato starch can be used in gravy, sauces, and soup as a thickener. In some things it does change the texture, so I am carefully what I use it in. I do love it for gluten free sausage gravy though. Potato starch is also used in gluten free baking. It lightens the texture of gluten free baked goods and tends to give them more of an airy texture. It works great in things like gluten free biscuits and gluten free rolls. Is also has a tendency to absorb more liquid than other gluten free, so it works well in items like crackers that need to be crispy. Do you have non digital books for sale? Not at this time I don’t. I am hoping to have some print available through Amazon next year, but am still working on it.